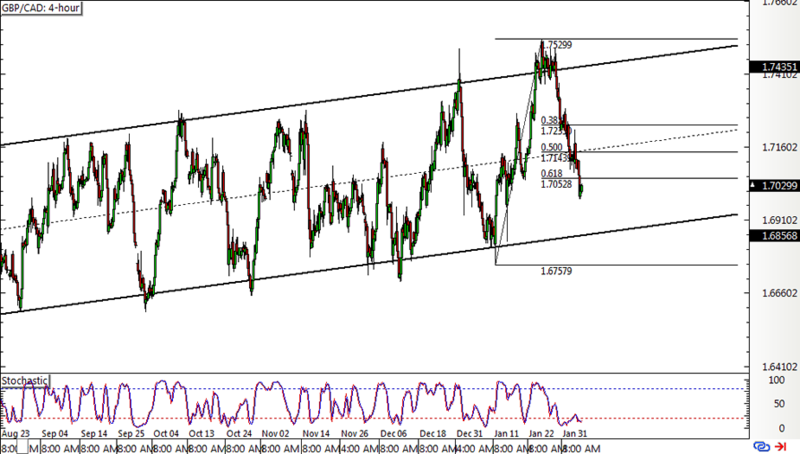 Trade Update: GBP/CAD Ready to Charge Higher? Ack! It looks like this pair didn’t gain much momentum to sustain its bullish run last time. I’m gonna keep close tabs on these support levels to see if I can catch a pullback entry. In my original trade idea, I was watching what seemed to be an upside break from GBP/CAD’s ascending channel on the 4-hour time frame. Thank goodness I didn’t hop in at market since price turned on its heel and tumbled afterwards! I’m seeing a potential pullback entry at the Fibs or maybe the very bottom of the channel near the 1.6900 major psychological level. The pair is still hovering at the 61.8% Fib and 1.7000 handle, though, so I’m gonna look out for reversal candlesticks that signal a bounce is due. Stochastic is already indicating oversold conditions or exhaustion among sellers. Turning a bit higher could coax pound bulls to come out and charge again, possibly taking price up to the channel top or the swing high. Looking at the U.K. events lined up this week reminds me that Super Thursday is coming up and this usually comes with a lot of volatility for pound pairs. All the Brexit drama from the previous weeks haven’t shown much progress, so I’m inclined to think that BOE Governor Carney could remind about the risks of a messy breakup. Then again, economic data from the U.K. has actually been mostly upbeat, particularly on the jobs front, so there could be some assuring words from central bankers. As for the Canadian dollar, the January employment report due later in the week could also pose an event risk. Market watchers could zone in on wage growth and full-time hiring numbers to see if the underlying numbers hold up. Crude oil is another story, too, as most supply and demand factors seem to be hinting at more gains for the commodity. OPEC output cuts are already in force and the sanctions on Venezuela weigh further on global supply. At the same time, expectations of stimulus from China and confirmation that the Fed could keep a lid on rates for much longer could prop up business demand. I prefer to wait for the BOE Super Thursday to pass before setting any entry orders, then I might try to catch a long position if Canada’s jobs figures disappoint. What do you guys think? GBP/CAD Ready to Charge Higher? Pound bulls just won’t quit, huh? I’m seeing a fresh kick of bullish momentum on GBP/CAD, so the pair might be setting its sights on the next upside targets.